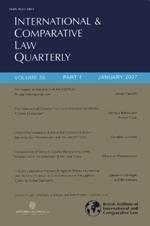 The fourth issue of International and Comparative Law Quarterly for 2013 includes several pieces on private international law. Simon Camilleri, Recast 12 of the Recast Regulation: a New Hope? This article seeks to consider the EU’s new approach to arbitration as set out in Recital 12 of the Brussels I Regulation (Recast). The article first considers the Court of Justice of the European Union’s West Tankers decision and the foremost English authority applying that case (The Wadi Sudr) in order to provide some background to the problem which gave rise to Recital 12. Following this, the article goes on to consider whether Recital 12 does in fact act as a solution to the problem created by the West Tankers decision. Justine Pila, The European Patent: an Old and Vexing Problem. In December 2012, the European Parliament supported the creation of a European patent with unitary effect. For the next year at least, the international patent community will be on the edge of its proverbial seat, waiting to see whether the proposal becomes a reality. If it does, it will be a significant event in both the long and rich history of patent law, and in the equally rich and understudied history of attempts to create a European patent system. In this article I consider the three post-war European patent initiatives of the most direct and enduring relevance in that regard with a view to answering the following questions. First, what drove them? Second, what issues confronted them? And third, how were those issues resolved and with what ultimate effect? In the concluding section I relate the discussion back to the present by offering some remarks on the current European patent proposal in light of the same. Csongor István Nagy, The Application Ratione Temporis of the Insolvency Regulation in the New Member States.